FORT MYERS, Fla. (January 16, 2015) – Pediatric Dentistry of Ft. Myers, Dr. Tim Verwest, DMD donated 100 toothbrushes to Tropic Isles Elementary community problem solving team. Personal hygiene bags will be distributed to children in need. “Our whole class got sick, so we decided to take things into our own hands,” said Amelia Mullee, a fifth grader at Tropic Isle Elementary. “I want to keep everyone healthy and germ free”. 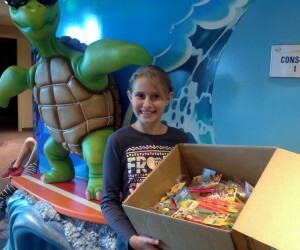 Pediatric Dentistry of Fort Myers regularly donates to improve community health and hygiene. In 2014 the office donated over 20,000 free toothbrushes to children in Lee, Collier, and Charlotte County.